OK, I know, this isn't exactly exciting stuff. 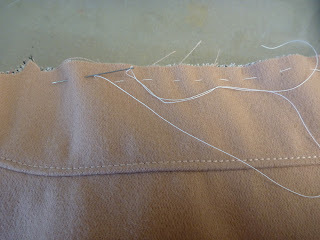 I've described this process on other coats, so this is primarily for the benefit of my sew-alonger. These techniques are taken from The Bishop Method of Clothing Construction, a book from 1959 that I refer to often. The author, Edna Bishop, comes across as an imposing but somehow lovable tyrant. The cuff is turned up and pressed. The hem on the sleeve is 1.5 inches. A 2.5 inch wide strip of bias cut haircanvas is placed in the hem so that 1 inch of canvas extends beyond the raw edge of the sleeve. I baste it temporarily in place. 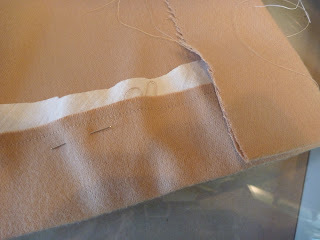 The edge of the sleeve is then stitched to the canvas with a 1/4" seam allowance. This is much easier to do on a free arm machine. On my 301 it's a PITA. The hem is turned up and the canvas is slip stitched to the sleeve. This produces a cuff with a little "oomph" to it. I think this is desirable on any outerwear. The muslin should run in under the facings and vent flaps just a bit. Maybe 1/2" . 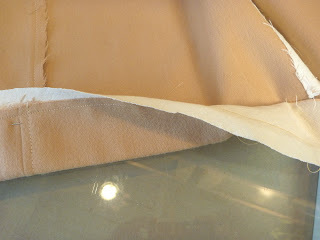 Again the muslin is stitched 1/4" from the raw edge of coat fabric. The muslin is then slip stitched to the body of the coat. 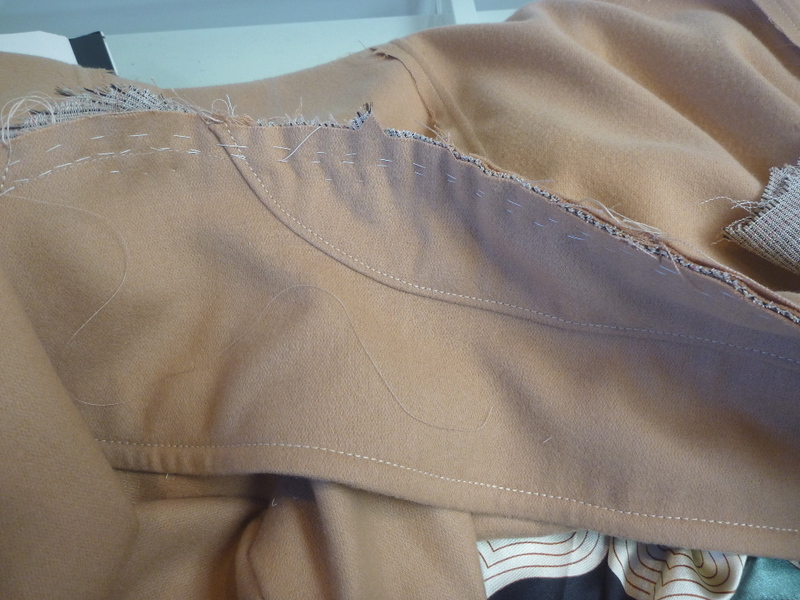 I don't have a picture, but the raw edges of the facings and vent flaps are cross stitched to the turned up hem. It might not look pretty, but it will eventually be almost entirely covered by the lining. I've mentioned this before, but what I'm about to do has NOTHING to do with the instructions in the book. It's just a technique that works for me. It gives a nice clean finish to the inside of the coat, and almost eliminates any hand sewing of the lining. Before getting started I've learned to make a simple hanging loop. It takes just a few minutes to make one from a scrap of lining material. 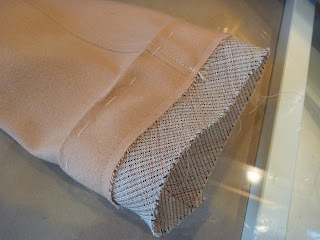 Center it over the back seam of the lining and baste it into place. I didn't do this on the frock coat and I've been kicking myself ever since. There are so many times when we have to hang our coats on a hook, and it's so much easier to add a loop now. 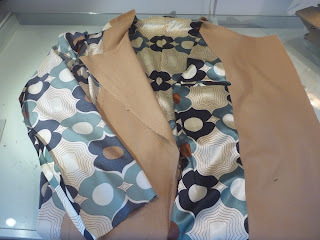 Next I pin and baste the collar to the right side of the coat. Be very sure you have it right side up! 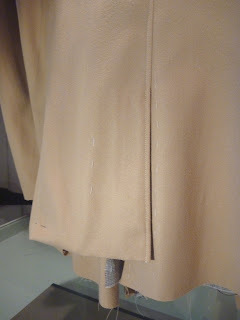 The undercollar side should face the right side of the coat. If I hadn't added a 1/2" to the collar I would never have been able to get it to fit. In fact, I could have used just a touch more length. It did, however, all work out in the end with some easing here and there. The seam will have to be clipped (hopefully you've staystitched just about everything) and basted like crazy. The goal is to get the collar to stay put. 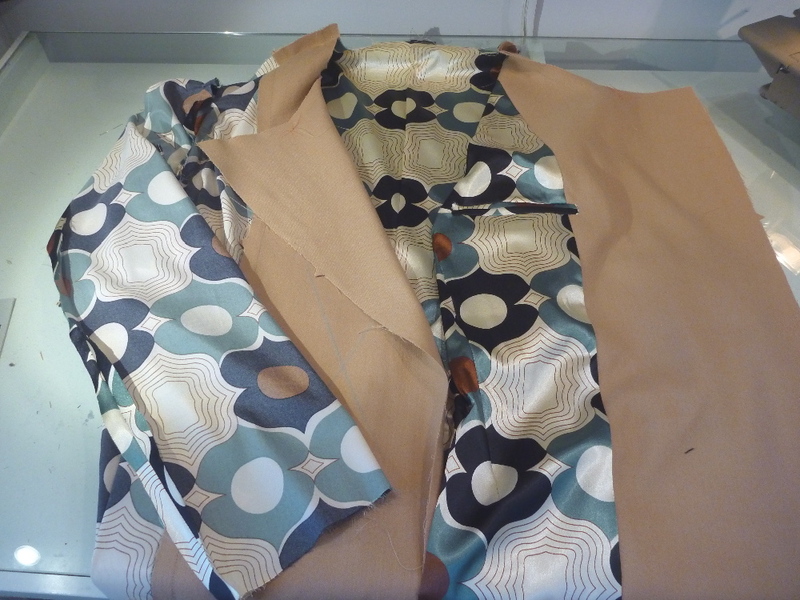 Next, the whole lining assembly is placed over the coat right sides together. The collar is sandwiched between the two parts. Pin and then baste the whole damn thing together. Don't give up, it's not impossible to do. There's just a ton of fabric to deal with. 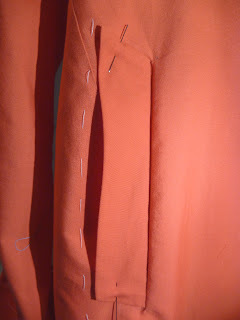 The seam will start at the hem and go up the front to the peak of the lapel. Then, with the needle down, rotate the work and stitch across the neck. My Singer 301 does a great job pounding through the 5 layers of fabric. 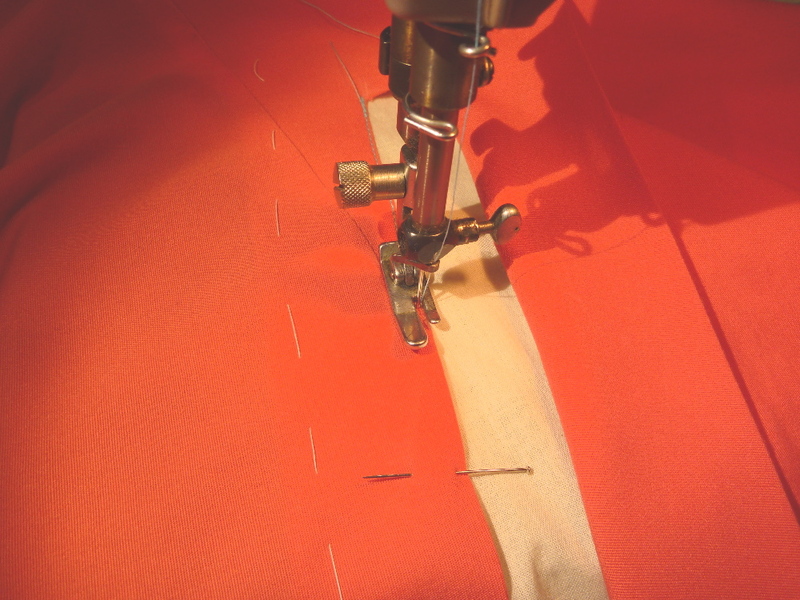 At the top of the opposite lapel, switch directions and stitch down to the hem. My only advice is to just take a deep breath and slow down during this whole operation. My goal is always NOT to have anything to rip out. There is a lot of bulk in the neck seam to put it mildly. I'm never sure what to trim. I decided to trim out only the collar seam. This worked well for me. Just be very careful with any trimming. One slip and the show is over. The lining assembly is then flipped to the inside of the coat and pressed. Now it's actually starting to look like something! When pressing the top of the lapels you will want the seam to roll to the underside. 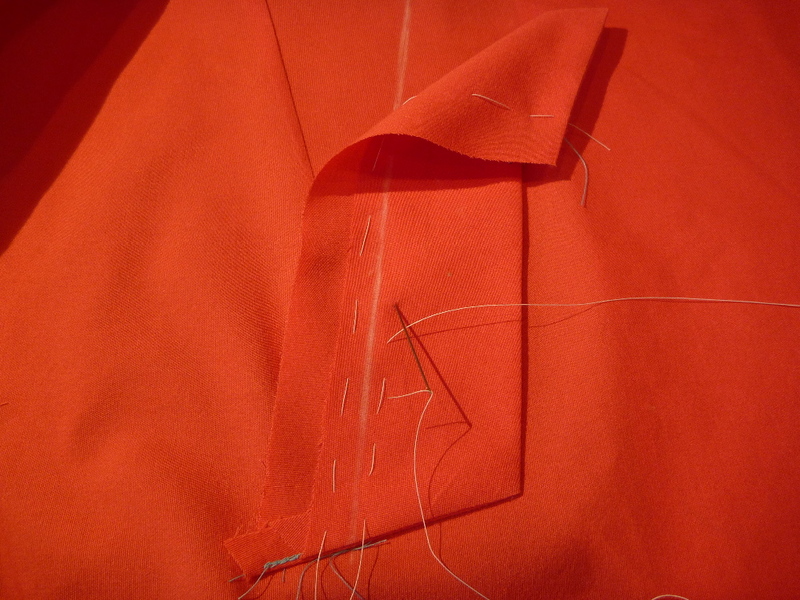 At the level of the second button hole you will want to transition that roll to the other side of the front. That way when the coat is buttoned the seam will not show. 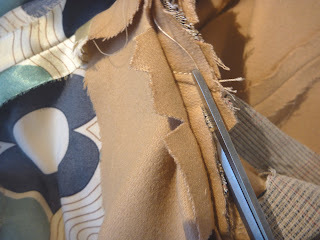 The only way I know to keep this "roll" in place is to baste the coat front prior to topstitching. Topstitch the coat fronts and add the button holes. Big disclaimer here. I am by no means an expert or any kind of authority on how to make men's coats. I just go with what works for me. So at this point I put the book away, because I'm totally ignoring the method employed. Both the collar stand and the undercollar are interfaced. 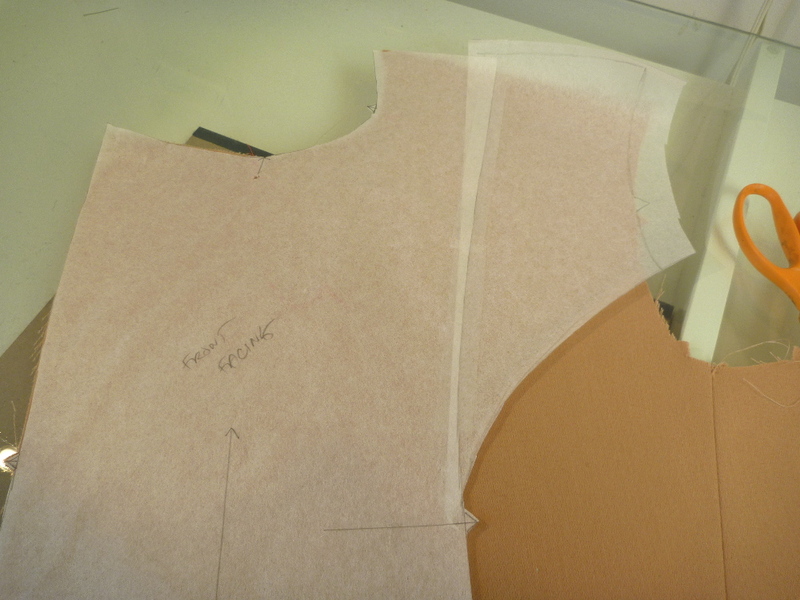 The undercollar is cut on the bias and I'll interface it with haircanvas also cut on the bias. You probably know by now that I'm just not a fan of fusible interfacing. This is probably because I've only ever used the stuff that's available at JoAnn's. It always seems to bubble up on me, and it just looks bad. The haircanvas may take a bit more time, but I'm always pleased with how it turns out in the end. Plus I'm a freak, I love all the handsewing! Anyway here I am cutting the bias interfacing using the collar stand as a pattern. I save just about every little scrap of haircanvas because they can frequently be used for things like this, or epaulettes, or sleeve tabs. Oh..... and I'm cheap! The instructions in the book show the upper collar interfaced. Again, I'm no expert but I think this is wrong. Feel free to corroborate or correct me! 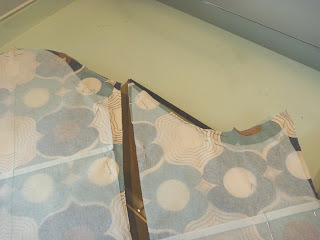 I assembled the collar stand to the upper collar and topstitched along the seam. Neither piece is interfaced. 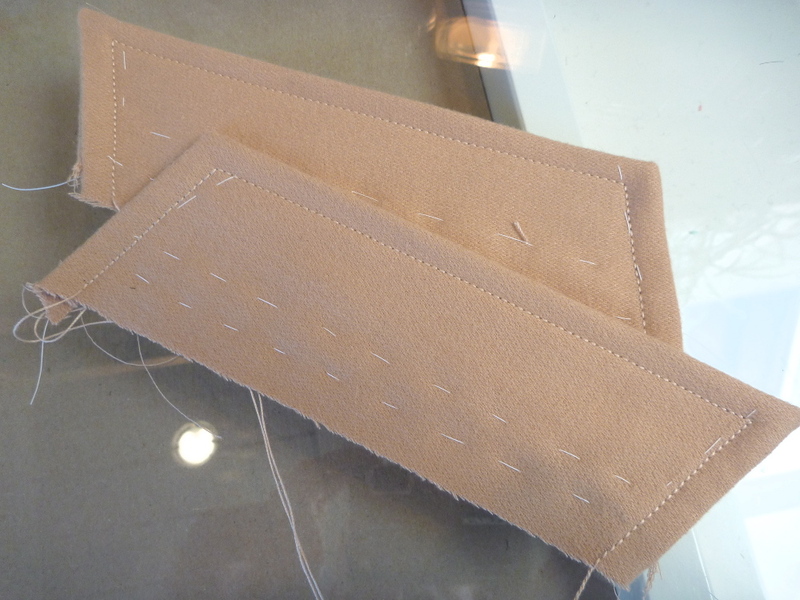 The two collar units are then sewn together, turned, pressed and topstitched 3/8" from the edge. One very nice thing about this pattern is that the upper collar is cut larger than the undercollar. This way when the collar is turned and pressed the seam will want to roll to the undercollar side. It gives a much more professional appearance. 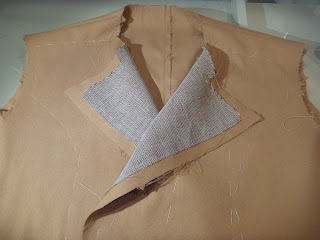 To keep that seam rolled under I suggest basting the edge of collar before the final topstitch. Lastly, the neck edges are basted together. None of this was quick. In fact, it took me two days. But the collar is a very "in your face" part of this coat, and I wanted it to turn out well. Now it's time to put the whole thing together. I've said it before, I'll say it again, I HATE working with polyester lining material. This crazy stuff was $2 / yd and comes with the added bonus of a little lycra. The stretch is probably a good thing for wearability, but makes it difficult to press. Hey, but it was only $2, right? The following is for the benefit of my "sew-alonger" and anyone else who has the book. Of course there are no directions, unless one reads Japanese, and the diagrams can be very vague. Hopefully this can smooth the way. 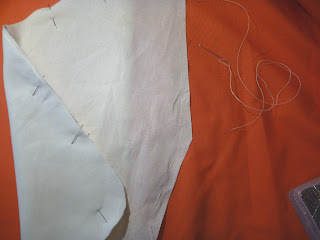 The center back seam needs to be extended from the neck to the waist level. This will create a pleat in the lining for wearing ease. The easiest way is to chalk mark 5/8" over from the center back down to waist level. The rest of the back pattern is unchanged. 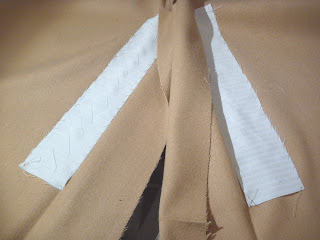 Be sure to clip the seam lines and folds for the vent! A lot of the fabric at the vent will eventually be cut away, but I leave that until almost dead last. 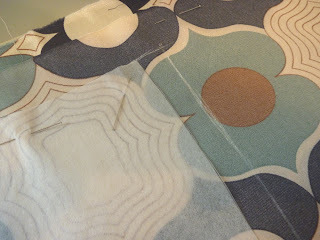 Stitch the back down to the start of the vent using a 5/8" seam allowance. Now go back to the neck edge and make another parallel line of stitching 5/8" away from the back seam. This line of stitching only has to be 1 - 1.5 inches long. This will create the tuck at the center of the neck seam. 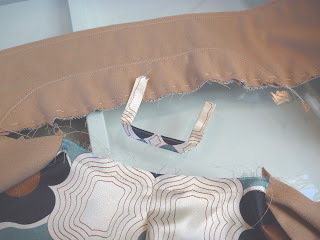 Extra fabric also has to be added on in the arm pit area. If you refer back to the cutting diagram you will see that 3.5 - 3 Cm is added. Don't drive yourself crazy here. Get the general gist and chalk mark a close approximation onto your fabric. Here are the sleeves cut out. I did have to ease the sleeves a bit more than usual, but it all works out in the end. Plus, it's just a lining. I wouldn't be concerned about any little tucks that may happen in the sleeve area. 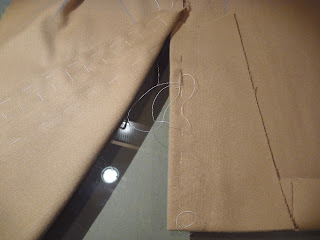 It's a heck of a lot easier than sewing the lining in by hand. I also added a left chest pocket because I think it's a nice feature to have on a mans coat. I like having a place to put a letter, bill, directions etc. 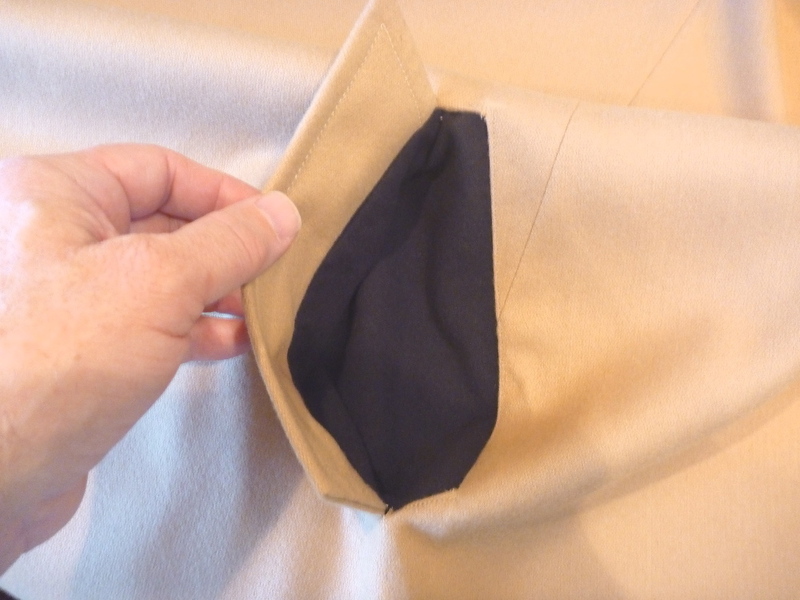 This is a double piping pocket a la Cabrera. It's not the best one I've ever done, mostly because the lining fabric doesn't take a pressing well. No close up photo of this one! It functions, it's on the inside of the coat, no one sees it. Here's the finished lining. I'm always glad to get to this point because I know it can't get any worse. The next and final hurdle will be the collar. I'm really deviating from the pattern / instructions at this point. 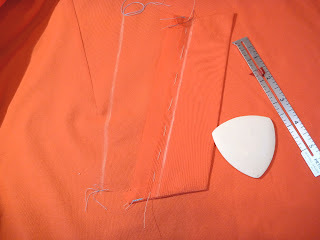 My issue is that I'm going to be inserting shoulder pads, and I only know one way to do it! 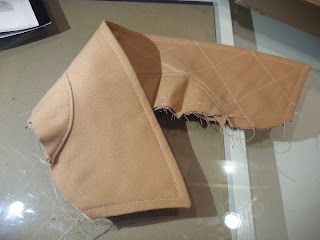 It involves pad stitching the shoulder pad into haircanvas which extends across the upper chest to the armscye. 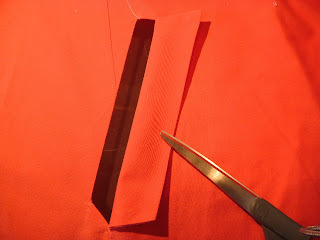 I used this technique on both the wedding jacket and the frock coat with good results. Why not use it here? 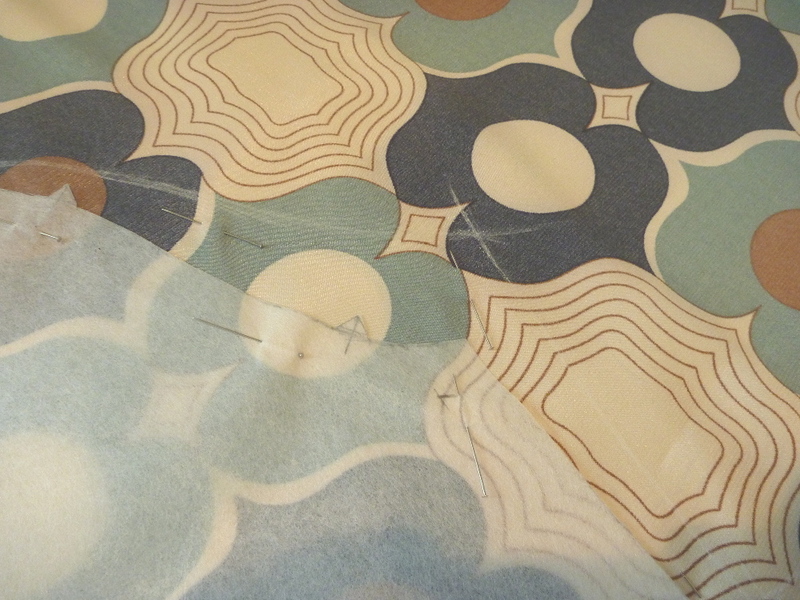 Here is the original facing pattern onto which I've taped a scrap of Swedish tracing paper. I've lined it up over the coat front and made a curve over to the armscye. There's no sense in making the extension fit the coat front at this point. Just roughly cut out the haircanvas at the shoulder and the armscye. Better to have too much fabric than too little. Excess canvas will be trimmed away after basting the front to the canvas. The coat front is then placed on top of the canvas and basted into place so that they become one. During the basting process the fabric is constantly smoothed. The first basting line runs from just below the shoulder seam down the center of the coat front. 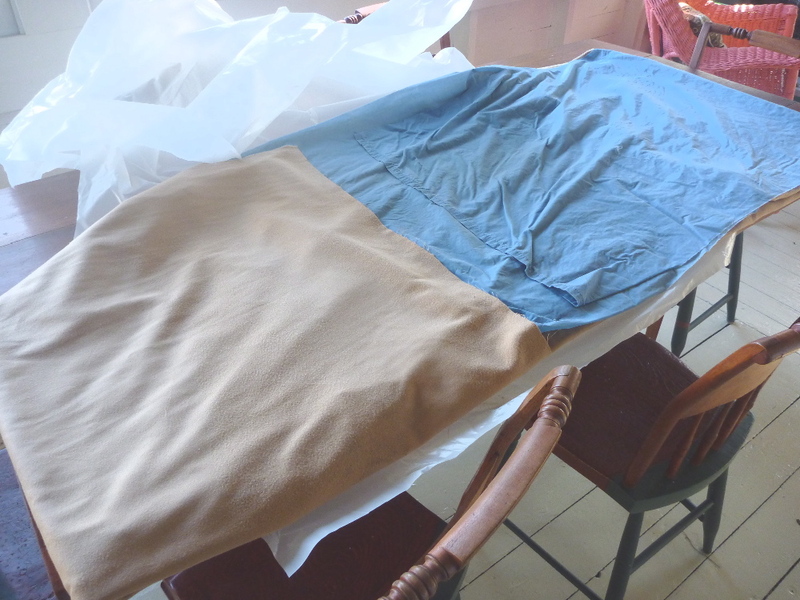 The fabric is then folded back to reveal the pocket. The edge of the pocket is secured to the canvas with diagonal stitches. 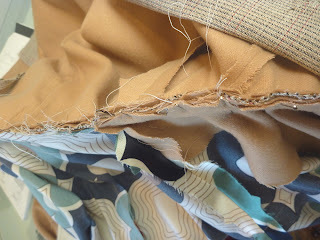 The fabric is folded back and basting continues. When the basting is complete, the excess canvas at the armscye and shoulder can be trimmed away. The back shoulder seam must be eased between the two notches. 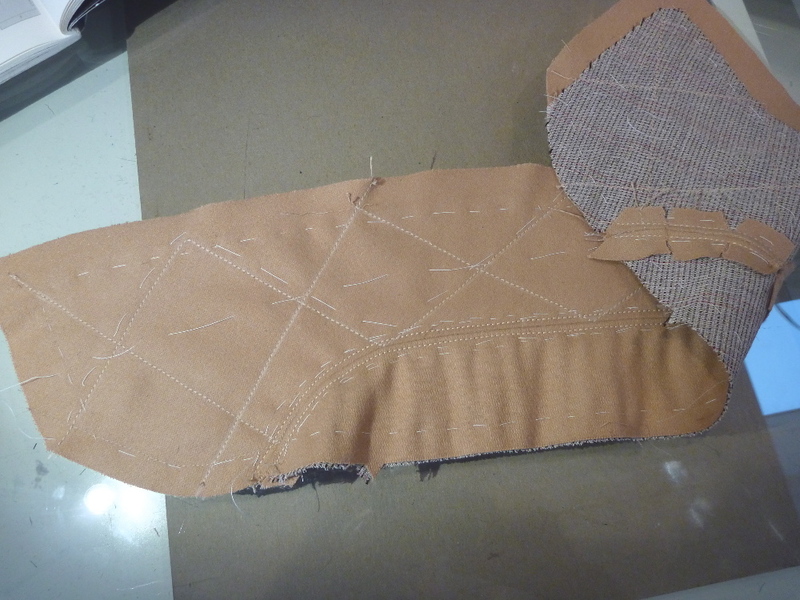 My buddy Cabrera would have me reinforce this seam with a strip of semi-bias lining material. I'm too lazy for that. Plus my fabric has very little stretch to it. We have to choose our battles, right? So here is the completed coat body, basted every which way, ready to have the sleeves set. I think I'll save that for another day. Three of the four designs in the Japanese coat book have a back vent. This is my third time around the block so I'll share what I've learned. 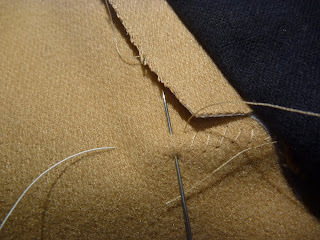 Hopefully, it will make it easier for anyone either sewing along on this pea coat, or working on another coat with a back vent. 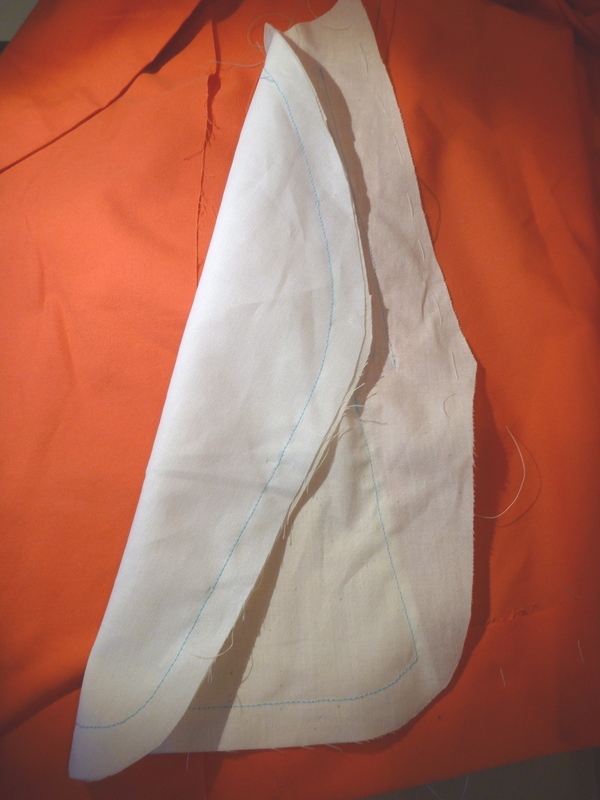 On your pattern, extend the seam line and the fold lines all the way to the hem. 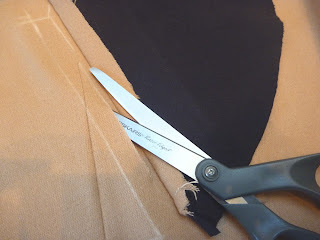 Highlight the end points so that you will take note of those areas when cutting the fabric. After cutting, make small clips at those highlighted points. Now you will know exactly where the fabric is to be folded and pressed. This will save you a lot of agony. The vent "flaps" are then interfaced with 2" wide strips of crossgrain pocketing. This technique is from the Cabrera tailoring book. Is it necessary? Probably not. But I'd prefer a more substantial vent with some weight to keep it from bumping out. That's never a very flattering look. 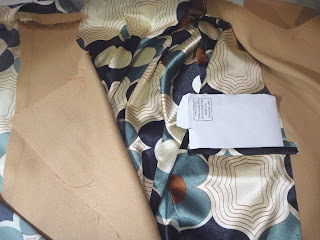 The instructions for this coat show a 7 Cm strip of something placed in the hem of the left vent. I'm not sure what it is. Looks like a drapery weight to me. I think I'll go my own way on this part. Fold and press the vent into position. Then open out the vents and baste the strips up against the folds. The strips are then slipstitched into place. These stitches should not be visible on the right side of the garment. Fold the vents back over the pocketing and baste them so that they are held in position. The left vent (on the right in this photo since this is the inside of the coat) will be topstitched. Therefore, the hem must be turned up first before the vent is pressed. 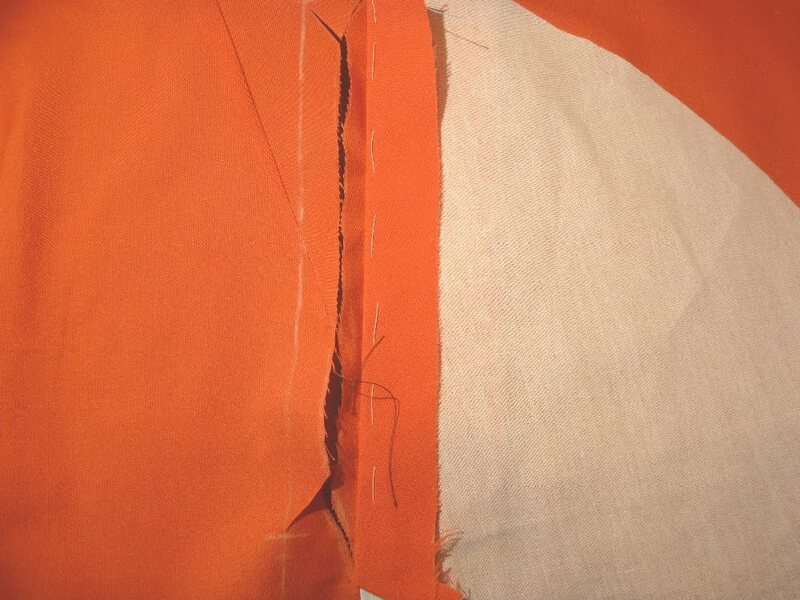 This coat is designed with a continuous line of topstitching from neck to vent. I like to baste the entire seam prior to topstitching. 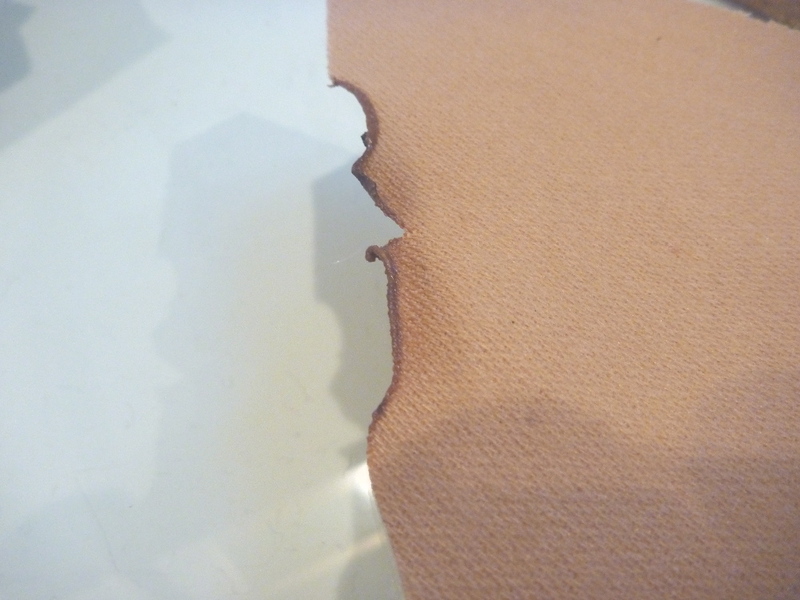 This prevents bumps from developing all along the topstitched seam. It also keeps the seam allowance in place underneath everything. I use the presser foot of my 301 as a guide. It's a two step process. Starting at the bottom I topstitch the vent. I then have to cut the thread, remove the garment from the machine and baste the vents into position. In my estimation one can't baste this enough. I take the garment back to the machine and pick up topstitching where I left off. Here's the finished vent. I'm pleased. It's hanging nice and flat. Finishing up the welt pockets. As planned, I completed the welt pockets this morning. A couple cups of coffee and I was ready to go. I find it much easier to work on difficult things when I'm fresh. 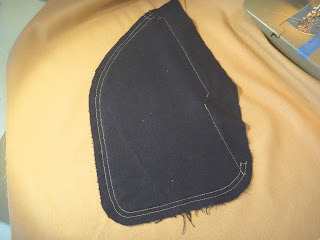 Here is the pocket all basted into place. I find the little extra time this takes is well worth it. 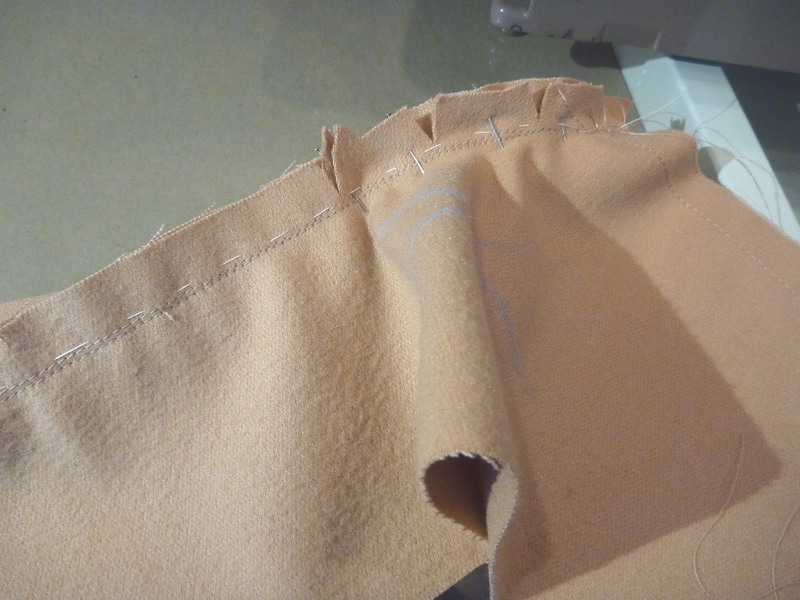 With everything securely basted in position, it's very easy to flip the work over and edgestitch the fold onto the pocketing below. I can't imagine trying to do this with pins. The pocket bags are then stitched together. Easy. The only step remaining is to secure the edges of the welt. This is the technique used by Roberto Cabrera in his tailoring tome. The welt edges are secured from behind using small diagonal stitches. You will be able to feel the welt edge through the fabric. Your stitches will be invisible from the front. I stitched back and forth along the edge of the welt twice to really secure it well. All the pattern pieces are cut out so I'm ready to start. I like to get the hardest parts out of the way first. For most coats that means the fronts, and that's the case for this pea coat. My plan is to do them over two days. Even though I've walked myself through the pockets, it will take a lot of focus and attention to detail. One welt pocket a day is enough for me. I interfaced the welts with hair canvas cut on the cross grain (otherwise it's impossible to fold). The seam allowances have been cut off and the canvas is basted into place. 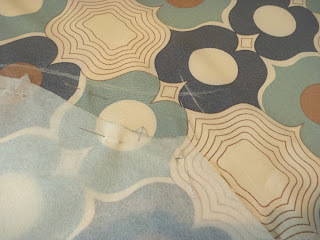 I also marked the wrong sides of my fabric with a chalk X immediately after removing the pattern. With fabric like this it gets almost impossible to tell one side from another. Sometimes it doesn't seem to matter. But I noticed while cutting out this "Not so much wool" wool, that the nap on one side is brushed very unevenly. I never noticed this in the store. Probably another reason it was in a pile at the back of the store! Here are my finished welts. I've topstitched them all around. 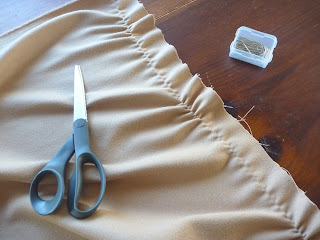 For my sew-alonger, this will be much neater and easier than the craziness shown on Pg. 62. 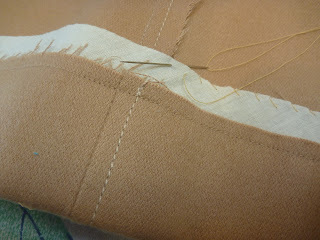 Rather than topstitch the completed welts into place I will handstitch them from the back side with diagonal stitches. 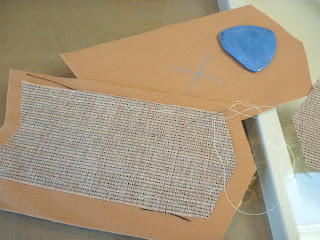 The front darts are stitched, cut open and then pressed open. A 1" wide piece of lightweight fusible interfacing is placed where the pocket will be slashed open. This is represented by a shaded rectangle on the pattern sheet. 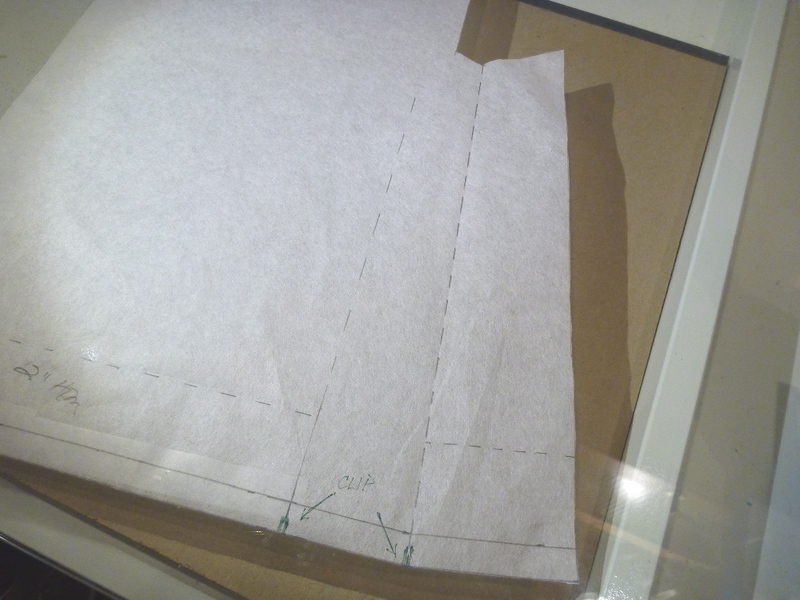 I then proceed to make the pocket, ever thankful that I took the time to make a muslin mock-up. Here I've chalked marked the slash marks, checked and re-checked them to be sure the welt flap will cover them when flipped back into place. Voila, the finished pocket lined with cotton flannel! I'm going to switch gears and work on something less intensive, like making the sleeves. The other pocket can wait till tomorrow morning. There's less chance of screwing it up then. I like to use the London shrink method for preparing wool fabric. It's simple and much less expensive than taking a length of fabric to the dry cleaners. God knows what they actually do there, if anything, other than waving some steam around. I used this method way back on the toggle coat so there is more information in the archive. It's really quite simple. You will need an old sheet torn into 30" wide strips. Soak the strips in a sink of water and then wring as much water as possible out of them. Lay the damp strips on one half of your wool fabric and then fold the wool over to make a "sandwich". Fold the fabric up to make a manageable package. 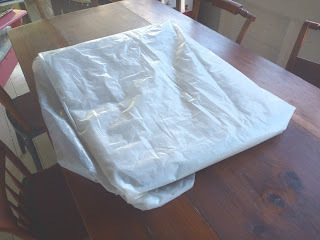 I then wrap the whole mess in some plastic sheeting to keep the moisture in. I let it sit over night. The moisture in the sheeting will gradually be absorbed by the wool, and in the morning it will all be of a uniform dampness. Unwrap and allow to air dry. Before cutting your pattern the cut edge of the fabric must be squared. This will insure that you have "grain perfection" and the garment will hang well. Pull a thread across the width of the fabric. Wow, look how easily I did this! That single thread is as strong as steel. I think my bargain "wool" is mostly NOT wool. Otherwise the thread would have been breaking constantly. I did a burn test, and although it didn't roar into flame, there's a hard plastic melted edge. Oh well, I'm not going to agonize over it. I have $30 invested. It's a great color and has a great hand. I'll just avoid gas stoves, bonfires and candles. 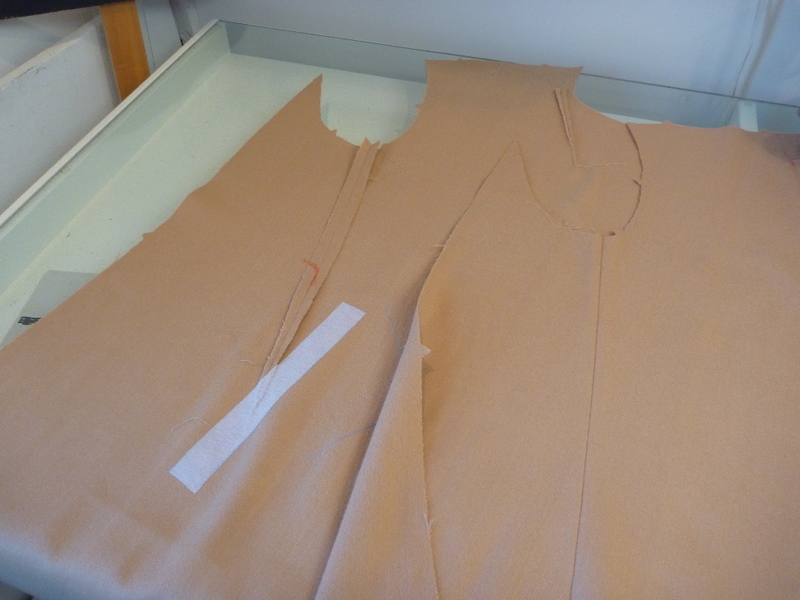 I cut my pattern pieces and mark the darts and placement lines with tailor tacks. I don't bother to tailor tack the buttonhole / button positions because they always fall out way before I get to that point. I think that's enough work for today. I'm actually to the point of actually putting this coat together. Yay! Now we're working on the inside of the coat. Take the larger pocket piece and align it with the other piece of pocketing. 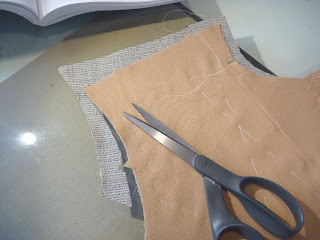 While doing this, smooth the pocketing and the coat fabric flat. 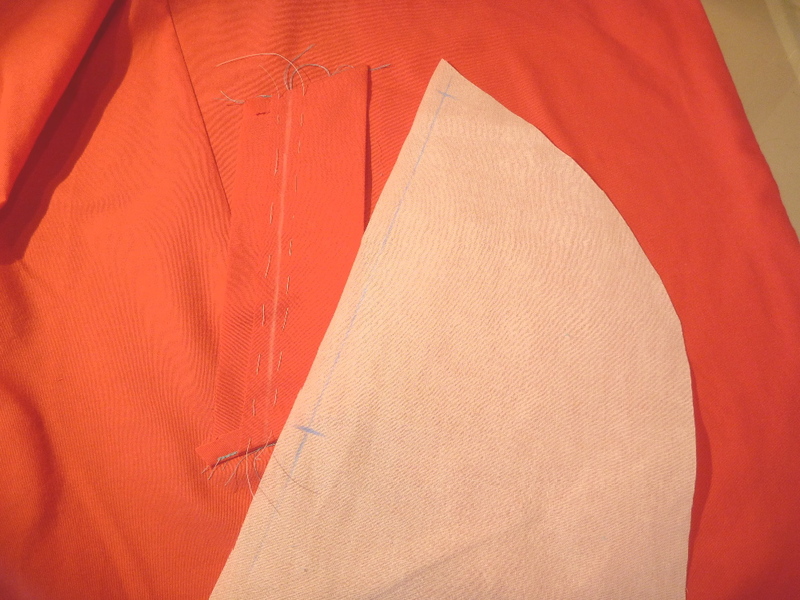 Pin the pocket bags together, but BASTE the the upper pocketing to the coat fabric above the welt opening. This will hold the pocketing in place for the next step. 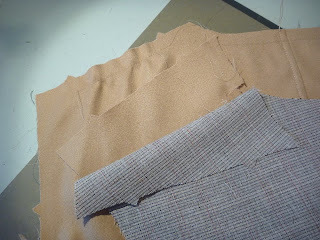 I'm a "baste-a-holic" so I would probably baste the entire pocket assembly to the coat front. 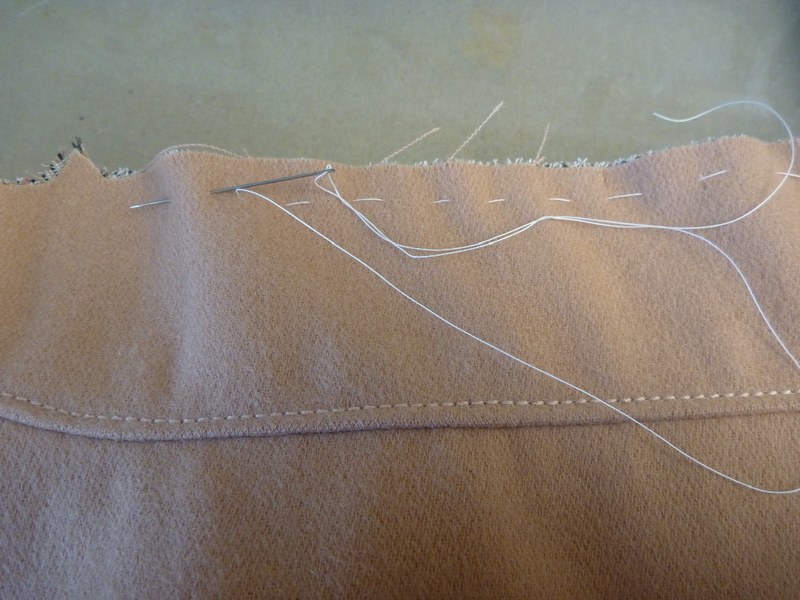 Now from the outside of the coat, edge stitch along the fold where the fabric was slashed and pressed back. The basting will help hold all this together and keep things flat. This will secure the pocketing at the opening of the pocket. 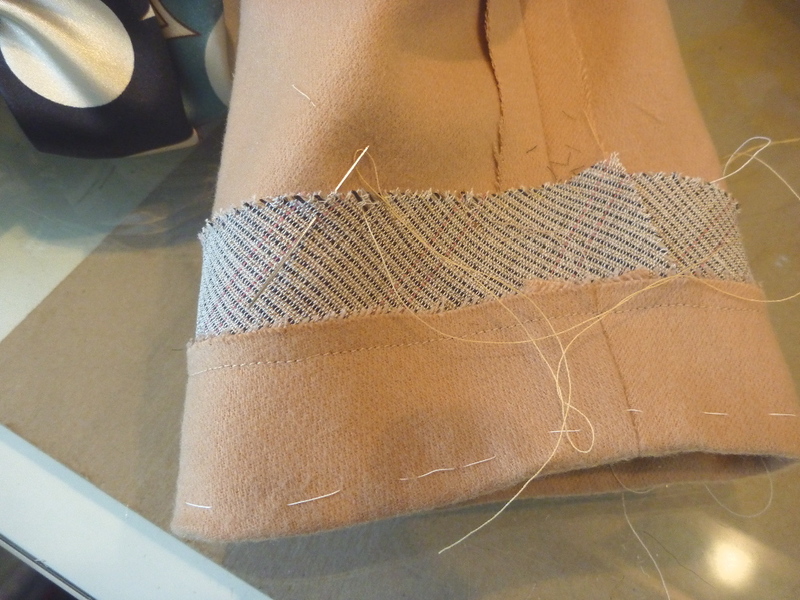 Now stitch around the pocket bags to complete the inside. The welts are then pressed back into position and stitched down. I hope this has been helpful. I know I'll be more confident when it comes to working on the real coat. It's good to be back. My mom is doing much better and I've left her in the care of her cairn terrier, Tessa. I'm back in Maine and back on the pea coat project. My "sew-alonger" in the UK has probably already finished the damn coat! 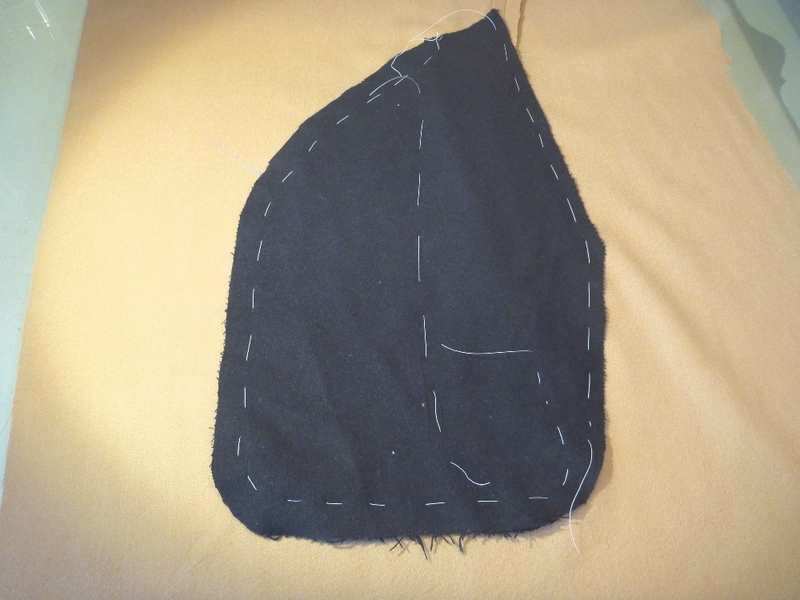 Anyway, today I did a mock-up of the welt pocket. This is the 3rd Japanese welt pocket that I've done, and I'm glad to report that it's also the easiest. I just always like to do a "run through" of the pocket so I know where I'm headed. There's a certain finality to welt pockets. They either come out well, or they're a disaster that's in your face forever. I think the practice, and finding where the potential pit falls are, is well worth the time and effort. 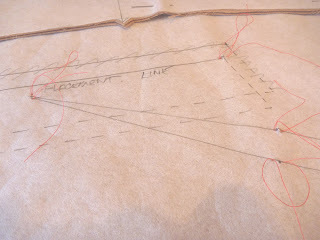 I don't usually go into this much detail, but this is for the benefit of my sew-along pal. OK. Here I've chalk marked the placement line on the coat and the stitching line on the welt, which has been turned and had its opening basted together. Once the welt is flipped back into position it will hide the end of the dart that extends down from the armpit. 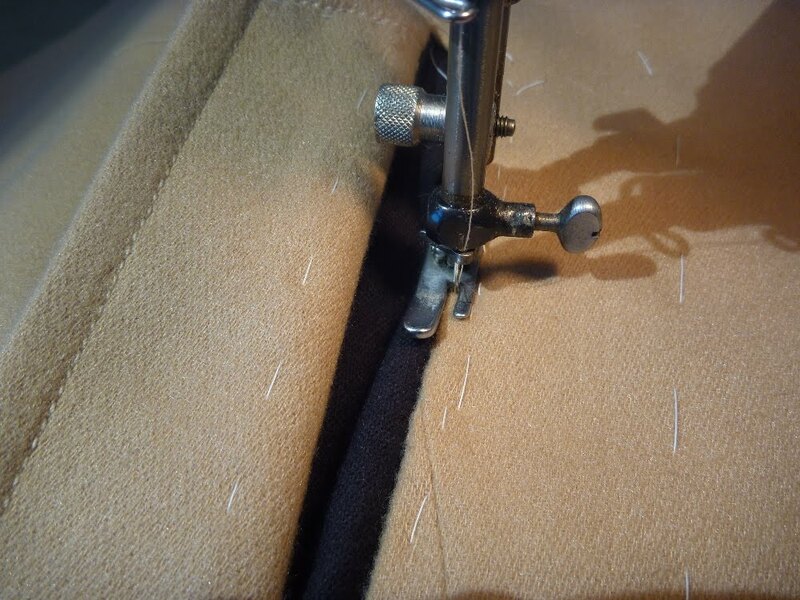 Align the welt stitching line directly over the placement line and baste the welt to the body of the coat. I always flip the welt over just to be sure I have it going in the right direction. Put the wrong welt on the wrong side of the coat and you're doomed. 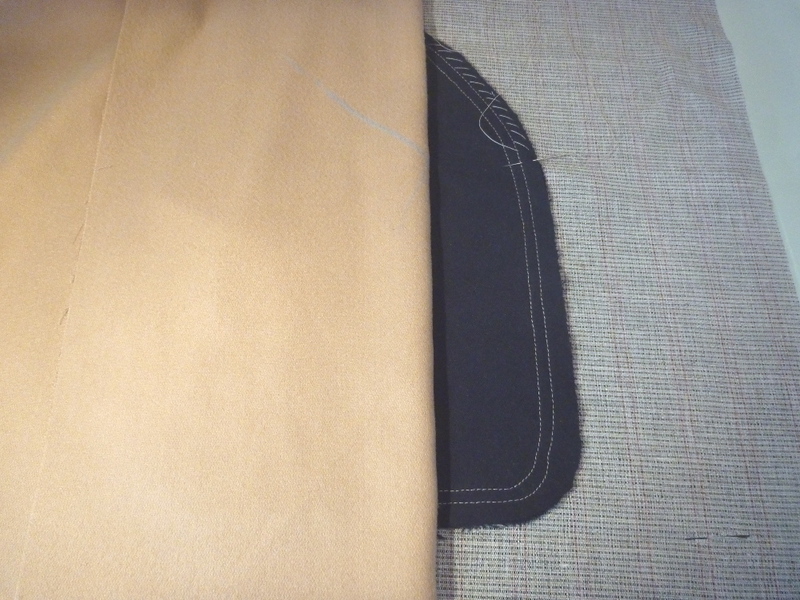 The pocket pattern of this coat includes all the seam allowances. Hooray! 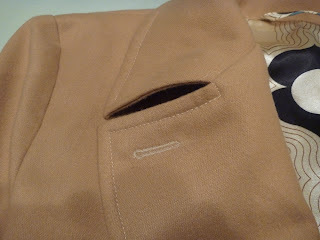 Here I have marked the stitching line on the smaller of the 2 pocket pieces. Align this mark directly over the stitching line on the welt and baste the pocket piece in place. 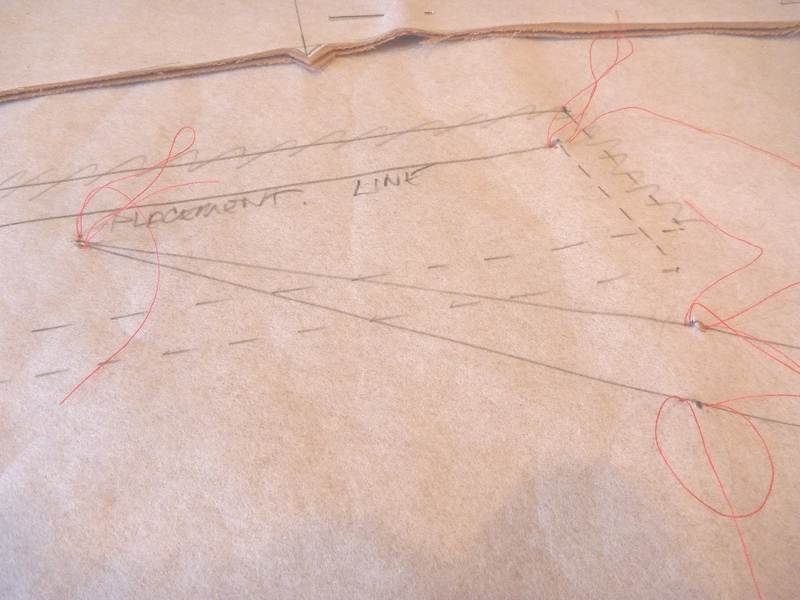 Now all of the 3 placement / stitching lines are one over the other. Stitch along the stitching line on the pocket, being sure to start and stop your stitches right at the edge of the welt. Take some extra care with this step. Now press the seam allowance of the welt and pocket back to get them out of the way. 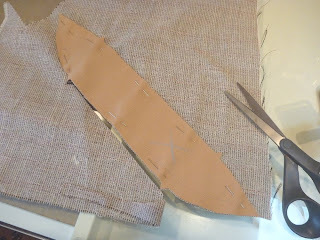 The coat fabric must now be slashed. This is the part that I truly hate. The slash lines are clearly denoted on the pattern. I approach this step with great caution. Because the welt is angled the "points" at either end of the slash will NOT be identical. 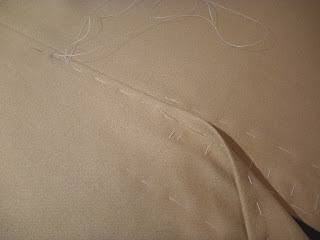 I flip the welt back and forth to be sure the points will be covered by the welt. Better to slash too little than too much. After slashing the opening, press the "flaps" back and push the pocketing to the inside of the coat. It should look like this from the outside.